Thanks to everyone who entered the Kollage Bellingrath Shawl and Socks pattern and Sockalicious Yarn giveaway! The lucky winner is: Ravelry commenter Janaknits! A big thanks again to the generous Kollage folks for providing the prizes. And now, our fall Giveaway-palooza continues! Today we're giving away another great prize, courtesy of Happy Hands Yarn and Fibers! 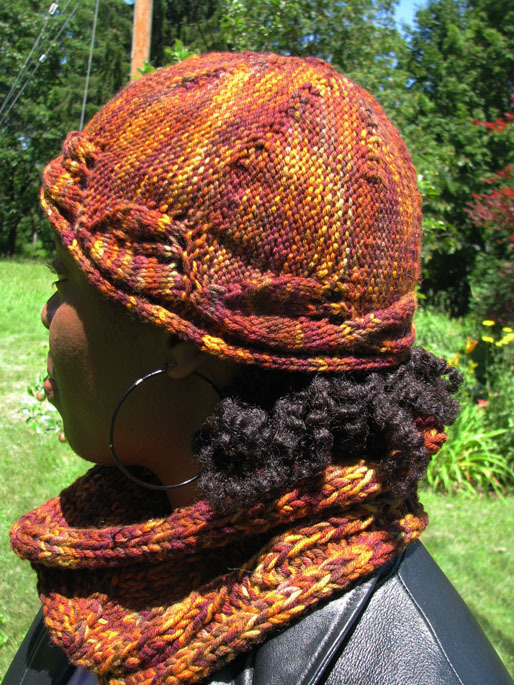 Enough Happy Hands Merino 560 yarn to make the Autumn Leaves Hat and Cowl set! This time, we're going to mix it up and give the prize to a member of the Knitcircus Ravelry Group, so if you're already a member, you don't have to do anything and you're automatically entered! We'll do the drawing Sunday evening, so everyone who's a member by then has a chance to win! Three runners-up will also receive Fall Pattern Collection downloads. If Ravelry isn't your style, you can still leave a blog comment as your entry.